This is exciting news! The quilt is going to be competing at the AQS Show in Daytona Beach, Florida. Those girls get around more than I do!! Wish us luck. Paducah, Kentucky, USA –” Slicing Seven” (Patt Anderson, Clara Gibson, Wendy Held, Pam Kay, Kay Laboda, Sally Parrish and Diana Price) from San Diego area are semifinalists for the 2017 AQS QuiltWeek® – Spring Paducah, Kentucky April 26 – 29, 2017, at the Schroeder Expo & Carroll Convention Center in Paducah, Kentucky. 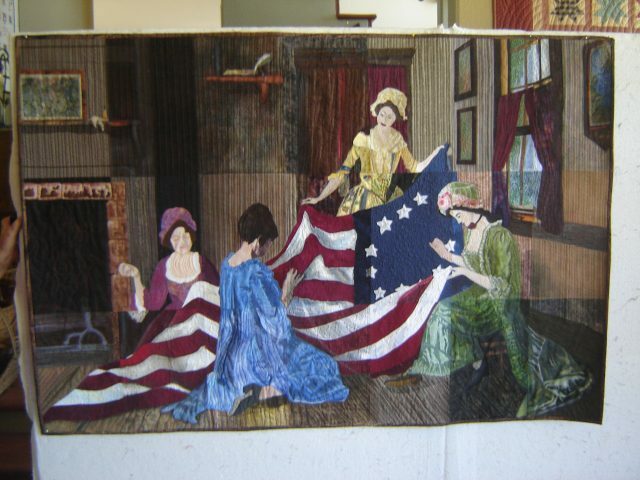 Slicing Seven have been chosen to display the quilt, BIRTH OF THE RED, WHITE, AND BLUE, along with 403 others in the annual contest, now in its 33rd year. Three quilting authorities will judge this elite group in Paducah, awarding first‐, second‐, and third‐place prizes in 16 categories, along with nine overall awards. Winners will be announced at the 33rd AQS Awards Presentation, which takes place at the Carson Four Rivers Center in Paducah at 5:00 p.m. on Tuesday, April 25. Cash awards totaling $125,000 will be granted, including $20,000 for the Janome Best of Show; $12,000 for the BERNINA Stationary Machine Workmanship; $12,000 for the AQS Hand Workmanship; $12,000 for the APQS Movable Workmanship; and $5,000 for the Robert Kaufman Best Wall Quilt. Regardless of how BIRTH OF THE RED, WHITE, AND BLUE places in the final judging, all semi‐finalists’ quilts will be displayed at the show, which is expected to draw more than 30,000 people. AQS Founder and President Meredith Schroeder says, “Extraordinary quilts are being made by today’s quilters, and the contest quilts represent an extensive variety of styles, sizes, and techniques. Each quilt in the show is an intricate, creative work of art to enjoy.” Quilts were entered in this international contest from 44 US states and 14 other countries. Come see a wide range of special exhibit quilts including: SAQA: Made in Europe; Kona Color of the Year 2016: Robert Kaufman Fabrics; Appliqué Quilts from the Collection of Pat and Arlan Christ; Cherrywood Challenge 2016: The Lion King; Focus & Fiber: Quilts by Melissa Sobotka; Double Wedding Ring Quilts: Traditions Made Modern by Victoria Findlay Wolfe; and the AQS Authors’ Showcase. The American Quilter’s Society hosts several shows annually, each with its own quilt contest. Besides the Paducah, Kentucky show, AQS hosts other prestigious shows in Daytona Beach, Florida; Lancaster, Pennsylvania; Grand Rapids, Michigan; and Des Moines, Iowa. 4 Responses to BIG NEWS–This quilt was also accepted at AQS Daytona Beach!! Heck yeah!! WAY TO GO MOM (and mom’s friends). I knew it would be a finalist. Now let’s see if it’s a winner. 🙂 Good luck! Wow Pam that is wonderful! !